Project TEMP was awarded Erasmus + funding in the summer of 2015 resulting in the two year Project being implemented in September 2015. The following outlines the Projects origins, its rationale and main aims. In the Winter of 2014 representatives of Västerås Kommun made contact with University College London exploring opportunities to work with a internationally renowned partner on a number of developmental initiatives concerning education. As a sponsor of an Academy school keen to work with European partners UCL placed Västerås Kommun and UCL Academy in direct contact with one another. In the Spring of 2015 two representatives from Västerås Kommun visited UCL Academy to open discussions about how both partners could work together, drawing on each others expertise and experiences of education, teaching and learning. I was fortunate to lead these discussions and work with the team from Västerås to begin exploring possible transnational projects. Common ground was found in our desire to explore the application of IT to enhance mathematical pedagogy. Västerås Kommun was already working on IT applications and how they could be used in the Math classrooms across the academic levels while UCL Academy’s Math Faculty was developing innovative ways to use iPads, Google Apps and questioning techniques to support highly able mathematicians aged between 11 and 14. It was felt that bringing these resources together could enhance not just practice within each educational context but could also be of benefit transnationally. This initial contact was followed up with a Skype meeting, in which further discussion was had about devising a valuable project concerning IT and Math pedagogy that would draw upon the skills of three partners including UCL Academy, Västerås Kommun and a Romanian partner, A.T. Laurian. A number of European partner countries was discussed but it was agreed that a Romanian partner would offer a valuable insight into a different mathematical culture and provide a further opportunity to draw on expertise and share practice to areas of Old Europe often neglected from EU funded projects. The Romanian partner was acquired through the network of educational bodies interested in and engaged in research informed practice already established by Västerås Kommun. Furthermore all partners have associated links with University bodies, an aspect all were keen to engage in the project during the application and dissemination stages. A small delegation from Västerås, including math teachers, returned to the UCL Academy to work with the Academy and two innovative maths educators. Across the day Project TEMP was brought into being, collaboratively constructed by representatives from all partners (at this stage A.T. Laurian was represented through online collaboration). Across mathematical cultures present within the European Union a desire exists to enhance the experience of math learners, in particular those from ‘disadvantaged’ backgrounds. Through an increased interest in math, comes increased motivation and with that enhanced results. This is particularly the case for male leaners of math where all partners felt that the gap between the genders was a concern.The mathematical cultures represented within this project each approach the teaching of, the learning process of and the output of math slightly differently yet all recognise a common need to address three pedagogic themes, Questioning, ICT and Assessment as Learning. Questioning encompasses both the ability for a learner to ask a question, free of fear, to aid their in class learning of math and a leaners ability to compose an effective mathematical question. A small trial conducted within UCL Academy highlighted that by learning about the features of an effective mathematical question and then designing and implementing an effective mathematical question learners enhanced their ability to answer summative math questions in examination scenarios. Such an approach will inform the development of this project. ICT offers a means of providing students with a means of asking questions and the means of designing and testing mathematical questions in a collaborative and real time forum. Applications such as Socrative and Google Apps places the teacher at the centre of the process while providing a safe environment in which leaners can take risks. A number of IT based programs exist for use in the math classroom across Europe but many act as games or simple assessment tools, which, at a high monetary cost, only develop knowledge and test that knowledge. Such programs fail to provide a formative means of developing math skills as they exclude both teacher and other students from the learning process. Such programs replace rather than enhance effective pedagogy. We feel passionate that IT software can be used to enhance math pedagogy, a learners experience of math education and in turn academic output. We feel that such a combination is pertinent across Europe when addressing the rising gender gap in math performance. For the past three years Västerås Kommun has funded a Doctoral project which has established a robust and evidence based technique for using the Socrative app to pose questions, not to merely assess knowledge and understanding but, to act as an opening move in creating greater dialogue within the math classroom. This Blended Learning approach offers an exciting and engaging means to engineer a math pedagogy anchored around questioning and responsive feedback; Assessment as Learning. Assessment as Learning is viewed as an effective extension of the popular and widely adopted Assessment for Learning process; a process not widely established within the Swedish or Romanian contexts. Assessment as Learning recognises that assessments of learning can be designed in such a way that they offer further relearning opportunities. More than formatively assessing knowledge, an Assessment as Learning pedagogy can use assessment to teach new content through providing opportunities to engage with content related to an opening question presented by a teacher or through ICT. Through a well designed formative and summative assessment, new learning can be achieved. Well utilised IT can offer a tool which can enable such a process to occur. A model which will inform aspects of the Project TEMP enquiries has been trialled in both Västerås Kommun schools and within UCL Academy. IT delivery of a ‘new’ math question-class dialogue-options explored and answer provided (IT)-correct answer provides rationale for the mathematical process: incorrect answer provides brief explanation and direction to a resource so the process can be explored and practiced. Drawing these three elements together we felt a cross over existed where IT could be used to enhance questioning and assessment, but for this to occur a new pedagogy is needed. It is hoped that through this project three partners, representing three mathematical cultures, each with their specific skills set concerning each aspect of the pedagogy (IT, Questioning, Assessment as Learning) and research process, should work together to devise, trial, apply, review a Technology Enhanced Mathematical Pedagogy (TEMP). It is proposed that between August 2015 and June 2016, working collaboratively to develop TEMP through face to face and online meetings, each partner would then apply TEMP to a particular mathematical concept and cohort of students relevant to the context of each partner; for example underachieving boys learning algebra. An application of TEMP within a partner institution will be facilitated by three educators working as a research triad. The research triad will consist of three math educators who will opt into the project and be guided by a project lead, who remains constant, within each institution. The three members each triad offer a different math skills set and additional mathematical culture insights due to their backgrounds and previous experiences. To increase the impact of the Project on practice within the schools an alternative three mathematicians would be chosen for the second year of the cycle. Within each institution an Action Research approach will be taken as the methodology of research. Within the UCL Academy this will be aligned with the CPL system to ensure that the Project can be facilitated and its results disseminated to the Academy teaching body. It is proposed that Qualitative data will also be collected from teacher participants as a narrative exploring changes in professional practice as a result of engagement with research and exchanges with other math cultures within Europe. These narratives will form an important part of the partner reports and collaborative report at the end of the project. Student evaluations of the TEMP applied will also be used to shape TEMP but also provide additional data about the effectiveness of the TEMP applied. The same process will be applied, with new students and teacher participants and a new focus for TEMP between August 2016 and the summer of 2017. Throughout findings and experiences will be shared between partners, greatly enhanced by the physical exchange of partners learning about different mathematical cultures and applying their work in new contexts. This is an important aspect of how the project will enhance a European Maths Professionalism. Each partner will produce their own findings to be presented to all partners online and in face to face presentations at the end of each cycle, which it i showed will be undertaken in Sweden where Västerås Kommun has the means to host the various delegations. All findings will be combined together into a collaborative report exploring the journey of TEMP, its students and educators and the impact of TEMP on attitudes of both educators and students. It is hoped that an application of the designed and refined TEMP will impact upon academic attainment and achievement but the main purpose is to increase student engagement with mathematics, especially amongst margin student populations, and to contribute to an enhanced EuropeanMaths Professionalism generated through an active engagement with a European design research enquiry. Project TEMP will explore how ICT can be used with mathematics as an inclusive and equitable means of teaching mathematical concepts. Through innovative means, students from differing European contexts may access the same concepts and make equal gains within Math questioning. One particular aspect we seek to address is the emerging disparity within rates of progress between Boys and Girls in mathematics through offering alternative means of engaging with mathematical concepts. An application of TEMP could result in increased male engagement and with this rates of progress in line with their female peers. This project seeks to contribute to the development of mathematics professionalism, within the context of education establishments serving 11-19 year olds, and influence teacher education through dissemination initially within associated University’s. It is proposed that The UCL Academy works closely with both the UCL Institute of Education and University College London to facilitate global dissemination of findings throughout Project TEMP. We seek to promote collaborative teacher development within Math pedagogy, through a shared approach to research, a shared TEMP development and application, shared dissemination of findings and through a teacher exchange enabling math professionals to share practice across European boundaries. By providing opportunities for teachers from differing mathematical cultures to work and learn together through collaborative practices we seek to model a enhanced means of transnational mobility of Math professionals. Through a shared understanding of Mathematical Cultures and the application of a levelling pedagogy such as TEMP removes boundaries of language thus enhancing teacher mobility. As the UCL Academy strives to become a recognised centre of excellence, engagement in such a project provides a means for the Academy and its distinctive features to permeate the borders of Europe. 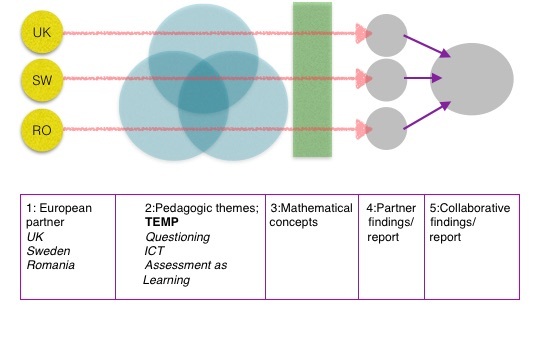 Project TEMP provides transnational training of Math professionals through collaborative inquiry, developing TEMP tools pools expertise from each partner and each Mathematical culture. The UK partner offers expertise in Assessment as Learning and the application of ICT, the Swedish partner expertise in questioning within Mathematics and the development of ICT tools and the Romanian partner expertise in assessment and high standards of Math education. This Erasmus+ funded European project seeks to provide enhanced opportunities to disseminate ongoing findings at a local and European level due to each partners relationship with an associated University. Such opportunities for enhanced dissemination is only possible due to the transnational nature of this project and the involvement of the selected partners. Dissemination of findings will occur throughout and at the end of phase cycle 1 and phase cycle 2 through a website dedicated to the project and through presentations delivered at each partners associated higher education institution. It is hoped that the report based on the findings of developing and applying variations of TEMP across two years and three mathematical cultures will be of value to a large range of interested parties. We hope that the IT tools developed through the project, once made available through our project website, will be of use to a range of educators. We also hope that due to the design of the project that further aspects may emerge which could generate initial reports and further collaborative projects. Such additional areas could include an exploration of a European Maths Professionalism and the effects of engaging with other mathematical cultures on practice.